If you’ve been keeping up to date with Butlin’s news (which I’m sure you all have!) 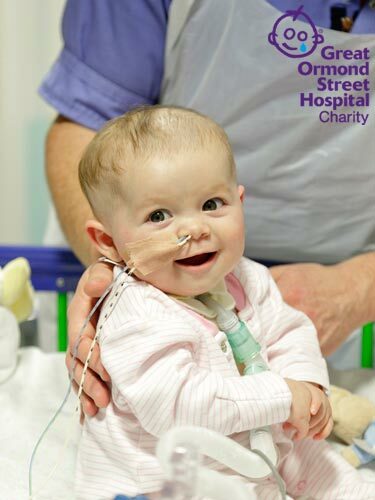 then you’ll already know that our partnership with Great Ormond Street Hospital (GOSH) launched in January 2015. Since then, we’ve funded a member of the hospital’s play team and several pieces of vital equipment. Well now we are delighted to share with you that we’ve raised enough to fund furniture and equipment for a four-bed bay on the hospital’s new cardiac ward which will crucially allow parents to stay beside their child. The most urgent area of funding at Great Ormond Street Hospital is a major redevelopment programme. Many of the inpatient wards, housed in a building built in the 1930s, are becoming increasingly unsuitable for the treatment of seriously ill children. Once the new clinical building, which funds we raise are supporting, opens in 2017, the hospital will be able to treat even more patients with some of the most rare and complex conditions. The world-class facilities within this vital new clinical building will provide more space, privacy and comfort for patients and their families during their stay including an en-suite bathroom and a bed to ensure a parent can stay by their child’s bedside, more room for children to play and eat together, and areas for parents to have a break. The four-bed bay which Butlin’s has funded will be located in the high dependency unit of the Cardiac Ward within this new clinical building. The furniture and equipment in the bay will include recliner chairs for parents allowing them to stay beside their child, privacy curtains and facilities to make their often long stays as easy and comfortable as possible. All of this means we’ll be helping little ones like April. When April was just five months old her parents were concerned because she was not putting on weight and when she caught a cold her health declined even further. Her parents took her to their local hospital where her heart condition was diagnosed and she was then rushed to Great Ormond Street Hospital. At GOSH, April was diagnosed with acute aortic stenosis, which meant her aortic value was deformed and the left side wasn’t working properly. April and her family then spent the following five months at GOSH, during which time April underwent a number of surgeries. The biggest of these surgeries involved her damaged aortic valve being replaced by her pulmonary valve. The pulmonary value was then replaced by a donor valve. April then spent a further month recovering at the hospital before going home just before her first birthday. April is now doing really well and comes to GOSH every six months for check-ups and is still seeing the feeding clinic. So thanks to the amazing support of Butlin’s team members and guests, between us we have raised an incredible £180,000 for Great Ormond Street Hospital Children’s charity. From Butlin’s British Bake Offs to swimming pool assault courses, we’ve been creative with our fundraising and will continue to work hard for this wonderful charity so they can help little ones like April get better.